According to the Government, In 2012-2013, Fire and Rescue services attended a total of 192,600 fires. Of these total fires, 22% of them were dwelling fires. If you break this down, that’s an estimated 42,000 fires, which is 115 dwelling fires every single day. Of these 42,000 fires, 24% of them are caused by electrical appliances. It’s important to spread the word about electrical safety in the home to reduce this number, which is why we have created a short guide below to help out. Did you know that by not havinga working smoke alarm fitted in your house you are twice as likely to be involved in an extreme fatality if a fire occurs; most often death? This is a serious matter, but still with 7% of people in the UK, that’s over 1 million people, not having smoke alarms in their homes, more awareness needs to be brought to the public. The best advice we can give to prevent a fire is to simply have a working smoke alarm in your home, and to test the battery at the beginning of every month. This takes just a few seconds of your time and could potentially save yourself and your families lives. It’s best to simply stay in the kitchen when using electrical appliances, keeping an eye on what you’re doing. Other simple causes, such as accidentally leaving your microwave on for too long, or even in some cases faulty equipment can be the cause, such as a toaster not turning off and setting your toast on fire. It’s also very important to make sure you educate your children on how dangerous these electrical appliances can be, and to note they are strictly prohibited from using any of them until they reach a certain age. The worse case scenario, often horrifically seen on the news quite frequently, are house fires started by electrical sockets during the night. 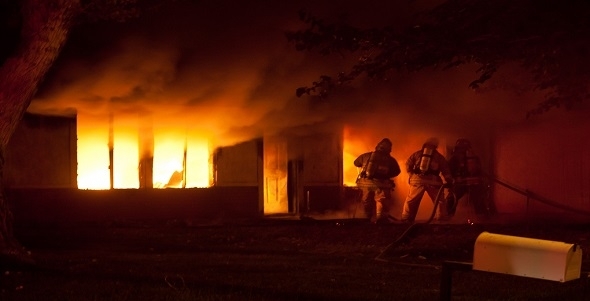 It’s everybody’s nightmare to wake up in the middle of the night hearing a smoke alarm ringing and being in the awful position of a midnight house fire. One simple way to prevent this is to turn off your plugs before you go to sleep or even during the day if you’re not using them. Faults like this may be rare, but they certainly do happen. With this it’s also a good idea to have your house checked with a periodic inspection report. For home owners this should be once every 10 years, once every 5 years for rented homes, once every 3 years for caravans and once a year for swimming pools. To summarise, keeping your home safe and your family safe is a critical importance everyone should take responsibility for. Don’t just assume you all know exactly what to do or assume someone is fully aware of what they are doing, a simple reminder can sometimes go a long way. Communicate and make sure your smoke alarm is fully functioning and has been tested, educate your children on electrical appliances and the danger that comes with them, and lastly make sure everyone turns off any electrical plug sockets before going to sleep. Want to know more about electrical fires, then take a look at the most common causes for electrical house fires!